Civil rights activists: It’s a great day for Section 8 tenants! Catherine Lhamon, attorney for Public Counsel, speaks at a press conference Thursday to discuss the settlement agreement with Los Angeles County that addresses Section 8 discrimination allegations. Various community groups were represented, including the National Association for the Advancement of Colored People, The Community Action League and the League of United Latin American Citizens. “It’s a day to rejoice that Lancaster and Palmdale will no longer be able to harass Black and Latino families in the Antelope Valley,” said Maria Palomares, attorney for Neighborhood Legal Services of Los Angeles. 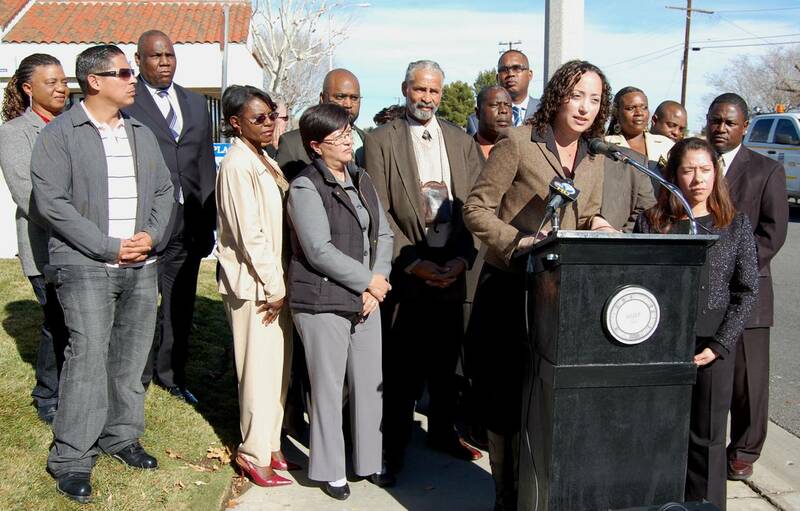 “By entering into this agreement, the Los Angeles County Sheriff’s Department and Housing Authority are taking a major first step towards preventing racial discrimination and restoring opportunity to more than 11,000 people who rely on the Section 8 program in the cities of Lancaster and Palmdale,” said V. Jesse Smith of the Community Action League (TCAL). The settlement agreement, approved by the Board of Supervisors Tuesday, was the County’s response to a lawsuit filed in June 2011, by the NAACP, TCAL, and three Section 8 tenants, claiming Black and Latino families using Section 8 housing vouchers in Lancaster and Palmdale are victims of constant, unbearable harassment at the hands of housing authority investigators, sheriff’s deputies and local politicians. Read the complaint here. The County was not named in the lawsuit because County officials agreed to address the allegations before the lawsuit was brought forth. “The County elected to ensure that it is not a party to discrimination any more,” said Lhamon. In contrast, city leaders have spread propaganda that preys on the worst fears of people to pit the community against Section 8 tenants, according to Darren Parker, Chairman of the Antelope Valley Human Relations Commission. “It’s divide and conquer at its simplest form,” Parker said. Parker said Section 8 tenants are probably some of the Antelope Valley’s better residents based on the number of hoops they must jump through to qualify for the program. The groups say the settlement agreement with the County is a step in the right direction, but now the cities must do their part. 2 comments for "Civil rights activists: It’s a great day for Section 8 tenants!" a victory for a few, a loss for the community. of course its a “great day” for them! it always has been when you can move into a neighborhood you cant afford and make everyone else pay for it! yeah it is a “great day”. I cannot even tell you how angry this makes me!